ComEd customers can get the scoop on smart meters as they are installed in deployment communities this summer. 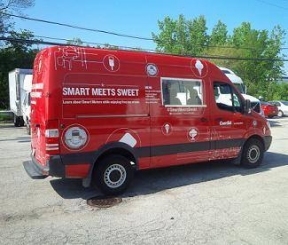 ComEd is using an ice cream truck as a way to start a two-way conversation with customers about smart meters and the benefits they offer. In addition to providing customers with important information, the ice cream truck also is providing tasty sweet treats to patrons. Through August 31st the ComEd ice cream truck will make stops in communities where ComEd is installing smart meters. Customers can follow the truck’s schedule on ComEd’s Facebook (Facebook.com/ComEd) and Twitter (@ComEd) sites. Furthermore, the truck is also part of the #SmartMeetsSweet Instagram contest. Customers are encouraged to take “selfies” with the ComEd ice cream truck and post the photos on Instagram using the hashtag #SmartMeetsSweet. By doing this, they will automatically be entered in a random drawing for a chance to win prizes, including a Kindle Fire® and iPad Mini®. Smart meters provide customers direct, 24/7 access to information on their individual electricity consumption, enabling them to better manage their electricity usage and realize meaningful energy cost savings.